— We’ll get a look at what’s planned to replace the apartment complex called Belle Isle Key, 31 Venetian Way, on the northeast quadrant of Belle Isle. If you remember, residents in 2010 successfully fought to scale back a previous proposal for the site, which now accommodates 120 rental apartments on 3.5 acres. But the developer decided it wasn’t worth building, and five years later has come back with a new plan. — We’ll learn about other projects planned at our doorstep: in Sunset Harbour, and on West Avenue and Alton Road. Did you know the old Boston Market site is being planned as a hotel by the same developer that shoe-horned the Marriott Residence Inn on the sliver of land north of 17th Street at West Avenue? More proposals are in the works for the land south of 17th Street between West and Alton and other sites. — We’ll hear a road construction and elevation update. The only truly good news — at least for most — is that the westernmost Venetian bridge is projected to reopen at the end of February. But more Venetian bridge work will follow. And the elevation work in Sunset Harbour will continue, and then comes more work on West Avenue and the construction of a new West Avenue bridge that links Sunset Harbour with the corridor to the south. The meeting, at Belle Plaza, 20 Island Ave., begins with a social at 6 p.m. Serious business starts at 7 p.m., and also includes election of association officers. 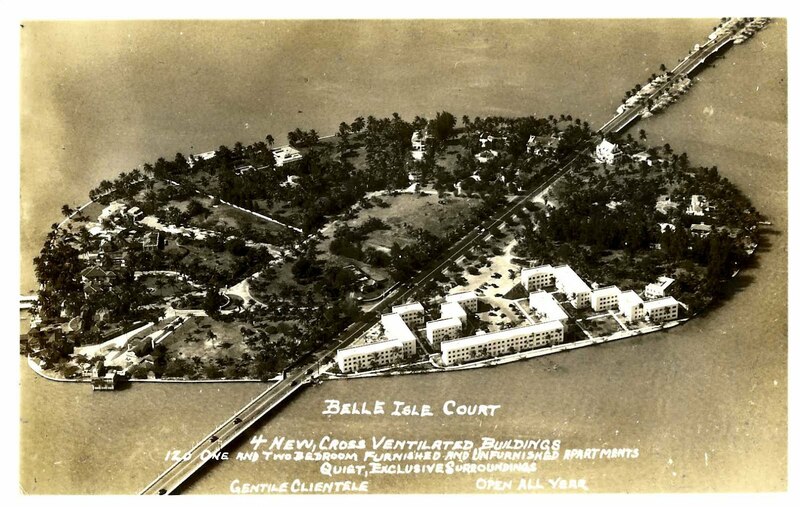 Belle Isle Blog found another historic postcard depicting the era of blatant discrimination on Belle Isle, again for the Belle Isle Court apartments, now known as Belle Isle Key. 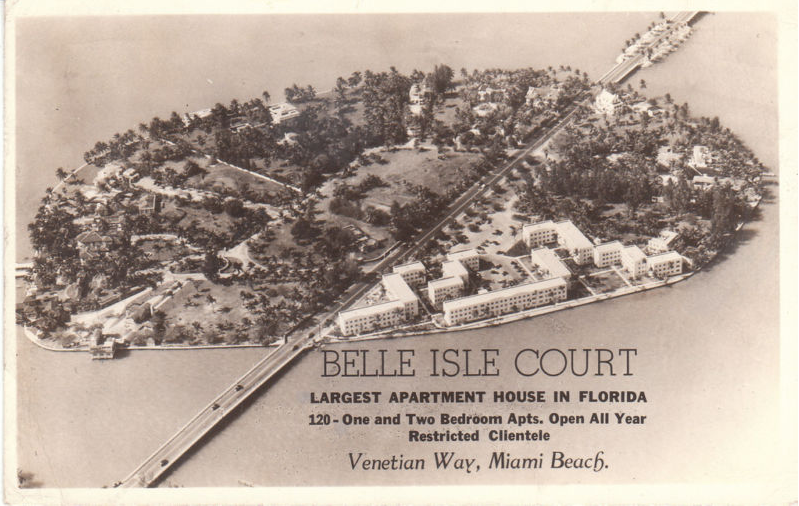 The postcard shows a Belle Isle entirely made up of estates, except for the one apartment complex. It’s worth a closer look. The view is facing west. Postcard depicts Belle Isle in the 1940s, “restricted clientele” only. A post card acquired previously with the same image, which appears to be of a slightly later vintage (and with a more professional font) advertised “restricted clientele” at Belle Isle Court. Both harken back to the era on Miami Beach during which Jews were banned from housing, an time that ended in 1947 when the Miami Beach City Commission passed an ordinance banning the practice. That action happened after the end of World War II, when many Jewish servicemen who trained here returned to live. It capped a period during the 1930s and 1940s when such restrictions and signs were common on the beach. The latest rendering of the apartment complex at 31 Venetian Way. The owner of the Belle Isle Key Apartments has appealed Miami Beach’s Design Review Board’s requirement to reduce the height of one of his two proposed apartment buildings from five to four stories. It comes before the Miami Beach City Commission on Wednesday. The design board voted 4-1 on July 6 to approve the proposed project at 31 Venetian Way, but only if one of the two five-story buildings proposed for the site is scaled back by one floor. During debate, project attorney Neisen Kasdin and architect Luis Revuelta said the owner of the project would agree to almost any change in the plan design — except for eliminating one floor from the eastern-most building in the project. The latest design tweaks include stucco stair-stepped on the west building facade. The architects planning the five-story apartment complex at 31 Venetian Way revealed more tweaks of the plans to Belle Isle residents Wednesday night, a prelude to a key design hearing next month where they hope to get the go-ahead for the 181-unit project. The Design Review Board will hear the proposal at 8 a.m. on July 6 at Miami Beach City Hall, 1700 Convention Center Dr. The new design would replace Belle Isle Key, a complex of three-story buildings on the northeast corner of Belle Isle. Key changes in the project include a wider view corridor between two proposed buildings, a slightly lower profile on the easternmost building, and a stepped stucco facade on the western building that architect Luis Revuelta said would ensure the project no longer looks like “one very long building.” The project adds 61 apartments to the three-acre site, and includes a 315-space parking garage, 28 of them for visitors. The current apartment complex has 120 units. The proposed apartment complex at 31 Venetian Way features a view corridor to Biscayne Bay. 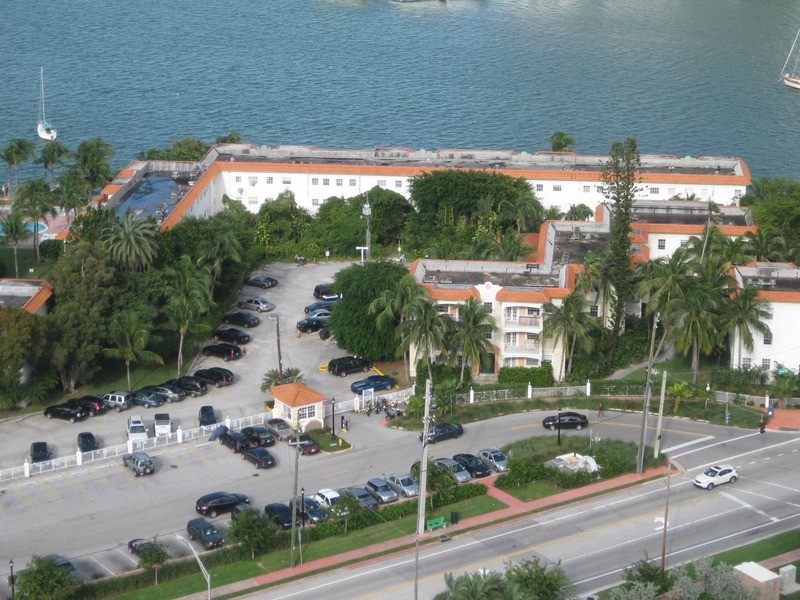 The owners of Belle Isle Key Apartments, who have plans to demolish the three-story apartment buildings on the northeast corner of Belle Isle to build a five-story complex, asked the Miami Beach Design Review Board to delay considering their proposal on Tuesday. The project now is on the May 4 Design Review agenda. The proposed project is taller than what’s there now, but plans are spiffier. What’s proposed: 179 units in five-story buildings topped by a tennis deck. It’s modern architecturally, and would include mostly small one-bedrooms (700 square feet) and some two-bedrooms (900 square feet). The site plan includes a total of 269 parking spaces. The renderings show a hole in the middle of the main building so you can see the bay from the street.